There’s a segment that starts around the six-minute mark on ‘Absent Friend’ where the guitars, soaked in reverb, chime and interweave, forming a delicate latticework of notes which is the very quintessence of post-rock. Hex was released in 1994. While much of the album isn’t quite post-rock as we now know it here in 2017, listening back to the debut album by the band which saw Simon Reynolds famously apply the term ‘post-rock’ (although often cited as marking the term’s coinage, this is as much-debated as what actually constitutes post-rock), it’s not hard to identify this as the definitive moment at which the tropes which define post-rock as we broadly recognise it began to coalesce. The intense and arduous work that went into Hex would ultimately lead to the band’s disintegration, and it would be a full twenty years before Graham Sutton would reconvene Bark Psychosis to deliver a second album in the form of ///Codename: Dustsucker. 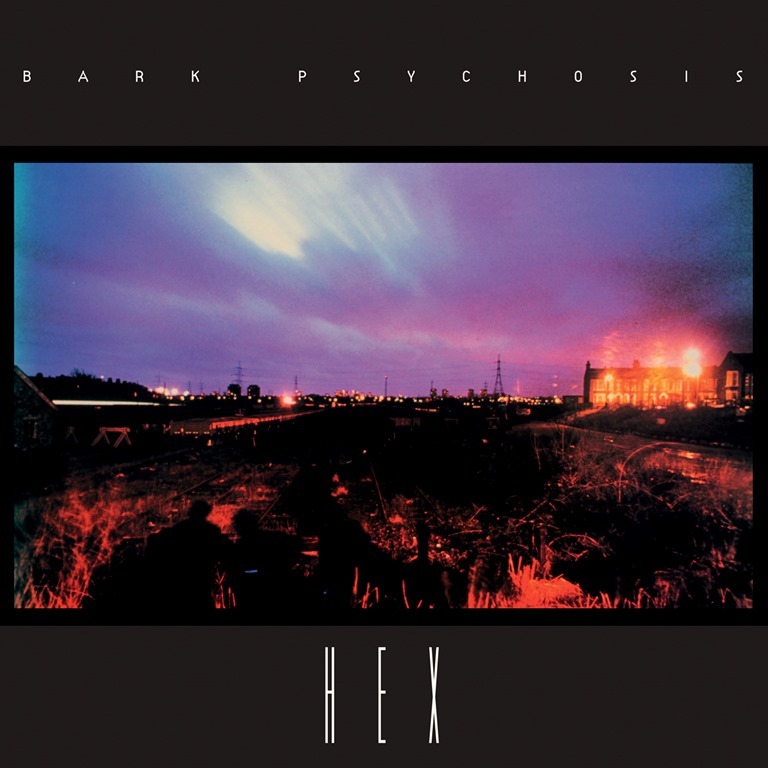 But one could reasonably argue that with Hex, Bark Psychosis achieved more than many bands could even aspire to over the course of ten albums. The delicate, evocative piano of ‘The Loom’, accompanied by soft strings arguably set a certain corner of the blueprint acts like Glissando and Her Name is Calla would come to place at the centre of their sound, and the meandering melodies would subsequently be developed by the likes of Oceansize – admittedly, more neoprog than post-rock, but this only highlights the range of Hex and the far-reaching vision it demonstrates. ‘Big Shot’ boasts a strolling bass and warping, dreamy atmospherics over a rolling glockenspiel and a semi-ambient breakdown in the middle. ‘Finger Spit’ may not feature the kind of epic crescendos which characterise a lot of ‘classic’ post-millennium post-rock, but its hushed, quietly intense space clearly explores surging dynamics. The gloomy discordant brass of ‘Eyes and Smiles’ prefaces the early sound if iLiKETRAiNS. And so on. Across the course of the seven tracks (these are long expansive compositions), Hex weaves cinematic soundscapes and wring all shades of emotion not from the lyrics and vocals, which are largely secondary, but from the music itself. It has texture and depth, and at its best, possesses a transportative, almost transcendental quality that goes beyond mere music. This, it’s fair to say, has been the ambition of the acts which have come to stand as synonymous with post-rock, disparate and different as they are, from Godspeed You! Back Emperor’s immense, surging soundscapes, to the chiming crescendo-orientated compositions of Explosions in the Sky via the twee elvin twinkles of Sigur Rós. Hex was certainly not an album of its time. 1994 was the year of In Utero, and Live Through This, Sixteen Stone by Bush, and Weezer’s eponymous debut, as well as Dookie, Smash, and Parklife, and Definitely Maybe, His and Hers, and The Second Coming¸ as well as Dog Man Star. As grunge jostled with Britpop in a divided musical landscape, and in a year which also delivered Pavement’s Crooked Rain, Crooked Rain, The Beastie Boys’ Ill Communication, and Manic Street Preachers’ The Holy Bible. Put simply, Hex did not fit. Amongst broadly contemporaneous works, it does share more commonality with The God Machine’s Scenes from the Second Storey (1992), Slowdive’s Slouvaki (1993) and Rosa Mota’s Wishful Sinking (1995) (all unappreciated at the time and still criminally underrated) than anything that could be considered zeitgeist. Now seems an appropriate distance to re-evaluate Hex. And even now, despite so many of its tropes having been absorbed, assimilated and endlessly replicated, it sounds beyond contemporary. It possesses so much depth and range, and conveys a close, personal intensity which has absolutely nothing to do with raging volume. Within or without context, Hex is a remarkable album. Yes, it effectively spawned a genre, and yet, it still stands apart. And that’s every reason to sit back and enjoy Hex not as an influential album, but simply on its own merits, of which there are plenty.